As housing prices continue to rise, and most major cities become severely unaffordable, Australia is experiencing a major demand for affordable housing. Between 2001 and 2011, housing prices increased by 147 per cent, while incomes in comparison grew by 57 per cent, according to a report by AMP.NATSEM. However, the availability of affordable housing in Australia is unable to meet this growing demand. It is estimated that there is a shortage of more than 500,000 affordable properties for low-income renters in Australia and that some 60 per cent of people on low incomes are under “housing stress". A property is deemed unaffordable if a household is required to spend over 30 per cent of its gross income on mortgage repayments or rent. A study from the Housing Supply Affordability Report 2012-2013 noted a wide range of factors contributing to the decline in affordability in recent years. These included cost of land, the challenge to raise finance, the complexity and inconsistency of the planning approvals process, difficulties with finding and purchasing affordable land and the costs of holding it, infrastructure levies, and regulation around the building process. These factors all drastically hinder projects by smaller developers. There is also reluctance within the industry to risk producing new and different products that the market might reject. However, the study notes a possible role for governments to act as a catalyst for innovation in projects, either by leading in their own projects or by requiring innovation in contracts with the private sector. Over the past few years, the Australian Government has assisted affordable housing projects with government funding and incentives such as the Housing Affordability Fund and the National Rental Affordability Scheme. The Housing Affordability Fund (HAF) is an Australian Government initiative aimed at reducing the cost of new homes. HAF is a five year $400 million investment by the Australian Government that helps to reduce the cost of new homes for homebuyers. The program provides grants to state, territory and local governments, to work in conjunction with the private sector, to reduce housing-related infrastructure and planning costs, and to pass these savings onto new home purchasers. Many projects are passing on savings as a rebate to home buyers at point of sale or through a discounted purchase price. The National Rental Affordability Scheme (NRAS) is a Commonwealth and State Government joint-funded initiative designed to tackle the issue of affordable housing. The NRAS aims to deliver 50,000 new dwellings across Australia to be rented out to low and moderate income individuals and families. New dwellings are required to be rented at a minimum discount of 20 per cent to market rent to eligible households as based on the Eligibility Thresholds. However, NRAS is not a public or social housing programme. It is a tax incentive to provide quality housing at below market rental rates. NRAS offers property investors a tax-free incentive for each property while participating in the scheme for a maximum of ten years. In 2013, the NSW Government approved the development of 88 new affordable housing units in central Sydney’s North Eveleigh precinct. The $21.8 million development will include a residential apartment building with a maximum height of seven storeys with 10 studio apartments, 37 one-bedroom apartments, 36 two-bedroom apartments, and 5 three-bedroom apartments. There will also be basement parking for 39 cars and 88 bicycles, and a rooftop garden and site landscaping. The North Eveleigh Affordable Housing Project will provide homes for more than 200 people within a few minutes’ walk from Redfern station, helping the NSW Government meet its housing targets for the Central subregion under the draft Metropolitan Strategy for Sydney, which calls for 82,000 new homes to be built by 2021. It will also support the Government’s plan to increase housing diversity by supplying more affordable housing options in central Sydney. The North Eveleigh Affordable Housing Project is also located directly next to the Government’s proposed Central Station to Eveleigh urban renewal project, which has the potential to provide thousands of new homes and jobs. Managing the project is not-for-profit organisation City West Housing, which assists people find affordable housing in the inner-city areas. The new development would provide people the opportunity to work and live in the Redfern area, which might not have been available to them due to high costs of rents. The project was a significant redevelopment for the Carriageworks area and also for City West Housing which won the tender for its design and development from the Urban Growth Development Corporation in December 2012. The $28 million dollar development has been partly funded through a $7.2 million grant from the HAF. It also received 88 NRAS incentives for the project. The North Eveleigh project is due to be completed in December 2014. In 2010 planning approval was granted for 207 homes for the Richmond housing estate. This was the first major affordable housing project on this land for 25 years, providing more affordable rental housing for lower income earners in inner city Melbourne. The 207 units are spread out over four buildings of between four and six storeys. Each new apartment has a balcony or private garden area. There are also semi-private courtyards to encourage a sense of community and interaction between neighbours. The new homes achieve an average six-star energy rating, and include storm water collection and reuse facilities, thermal glazed windows, hydronic heating, solar gas boosted hot water and bike racks. These features reduce living costs for residents. 19 of the 207 homes have been purpose-built for residents with physical disabilities. The remaining apartments can be adapted and are fully visitable by people with a disability. Car parking for residents with a disability is situated close to lifts for ease of access. The design was recognised in July 2014, when architecture firm Williams Boag won the Residential – Multiple Housing Award at the Victorian Architecture Awards. The $70 million project has been funded by the Australian Government through the HAF. The Spectrum Apartments project, made possible by the provision of prime state-owned land on Lutwyche Road, will be a $13 million residential and retail development. 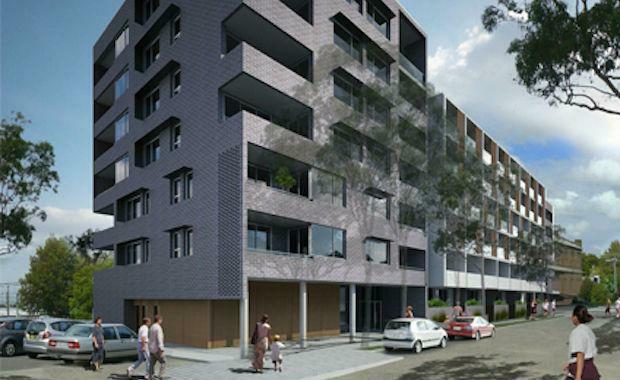 The Australian Government provided 4,370 square metres of previously vacant land to affordable housing provider BHC for the development of 60 new affordable and private apartments and retail spaces. BHC acts as a major source of NRAS developments in Queensland, taking advantage of the substantial lack of HAF and NRAS affordable housing schemes in CBD areas, and specifically Brisbane. said: “Spectrum Apartments will provide a path back to the inner-city for those who haven’t been able to keep up with Brisbane’s rising rents”. Designed by architects Cottee Parker, the development is scheduled to start early 2015, for completion in 2016.